Sardine: Where is the Sea? “The Word Is Yours” was a week-long event in October 2015 in which urban murals were painted in collaboration with the local community, hip-hop concerts were held as well as skateboarding or breakdance competitions. It was sponsored by Red Bull, Montana Cans, and National Paints and coordinated by Shermine Shawalha (Malahi) and Tia Korpe (Mektoub). The aim of the festival, in Shawalha´s words, was “to bring them [urban arts] together, to create the first interregional urban art festival that will help them meet, learn, question and create.” The festival invited graffiti artists like Fats (UAE), WizeOne (Jordan), Sardine (Jordan), Suhaib Attar (Jordan), DeevGraf (Jordan), Herakut (Germany), Ali Almasri (Jordan). The refashioning of the urban environment changes the relationship between youth and their own city. In May 2016 “Baladk” (literally: ”your city”), an urban art festival took place organized and coordinated by al-Balad Theatre sponsored by National Paints and Montana Cans. Graffiti was at the core of the activities as part of a process of the re-appropriation of urban spaces and redefinition of what it means to be ‘Ammani’. 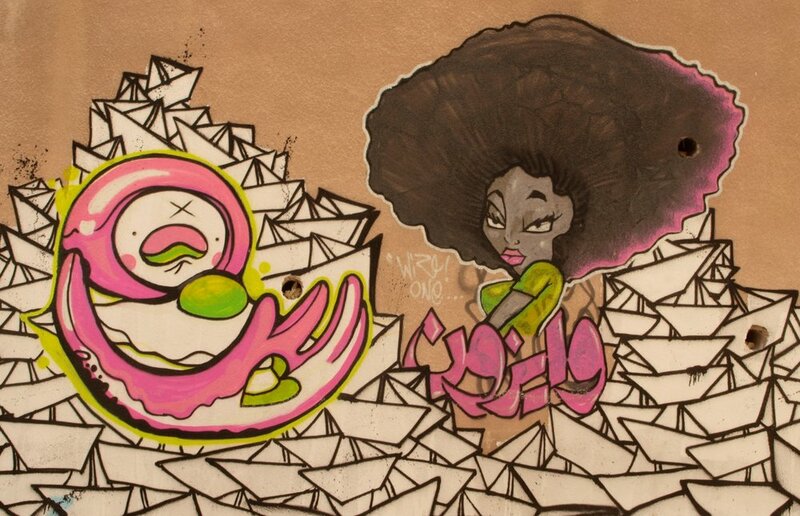 International artists like Dhad Store (Saudi Arabia), Ali Kelsix, Monstariam and Bufifty (Kuwait), Shoof (Tunisia), and Egor kabyone (Russia) participated together with Jordan-based Yazan Hija, Suha Sultan, Hind Al Far, Joanna Mdanat, Dina Fawakhiri, Azza, Yara Hindawi. The Greater Amman Municipality has adopted the trend of refashioning urban environments through graffiti. The art offers vibrancy that covers a decaying wall, attracts the eye and conveys a sense of modernity and youthful refashioning. Good examples are the recently renewed space of the second-hand Friday market in Ras al-Ain and the tribute to the centennial of the Arab Revolt at 8th circle. There are increasing public and international developmental funds dedicated to enhance this type of creativity. There is an attractive visible outcome, usually in the form of educational murals, with positive messages aimed at preventing political disenfranchisement. AptART is an international NGO that focuses on empowering excluded communities through artistic education. It has worked on projects in Syria, Iraq, Palestine, Jordan, Turkey, DR Congo, and Mozambique, as well as in Europe. UNHCR has developed similar projects in Dakar (Senegal), Zaatari (Jordan), and Kawergosk (Iraq). Although art is a very useful tool to fight against disenfranchisement and deal with social and individual trauma, there is a risk of superficial beautification of poverty and exclusion. Graffiti, once a form of artistic and political vandalism, has become radically de-politicized. It bears a weak counter-establishment voice in comparison with the iconic imagery from Tahrir Square at the start of the Arab Uprisings. 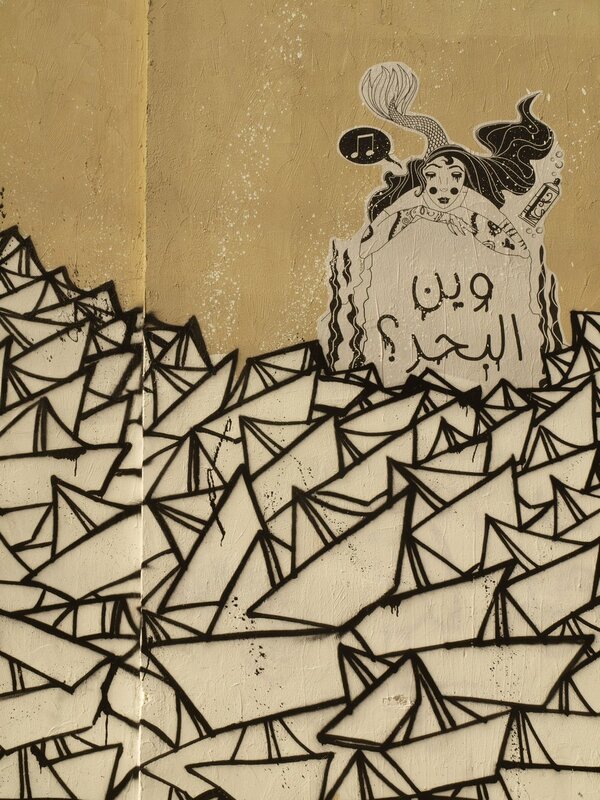 Furthermore, graffiti and urban murals are concentrated in gentrifying neighborhoods of the city, particularly Jabal al-Weibdeh and Jabal Amman. Yet, many truly enjoy the murals and hope for more colours on the streets. There is still a lot to be painted (and said). Julio Moreno Cirujano was Resident Intern at the British Institute in Amman from November 2015 to July 2016 and is now pursuing a PhD at SOAS in colonial material culture in the Mediterranean Levant. His interests dwell in the intersection between materiality and symbolic meaning in the production of both structures of power and cultural change.